Please submit this form and a 500-750 word essay to scholarships@coe.ufl.edu to be considered. Five awards of $1,500 available! More info here. 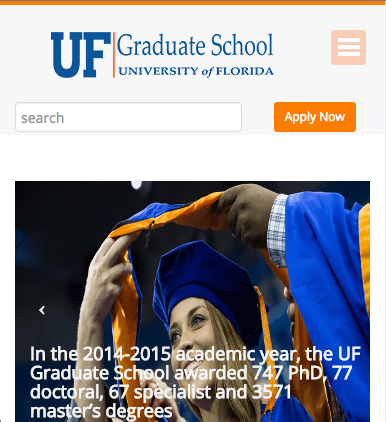 I am a masters student in the Food Science and Human Nutrition department conducting an IRB approved study (study number: IRB201702863) assessing dietary intake of fruits and vegetables and eating behaviors in University of Florida students. 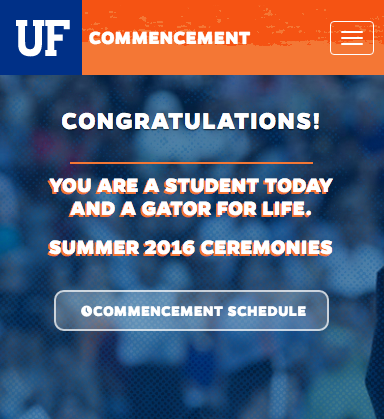 To be eligible to participate, you must be a current University of Florida undergraduate student between the ages of 18-29. It is an online survey that will take approximately 20-25 minutes to complete. Your help in completing this research study is voluntary and would be greatly appreciated! 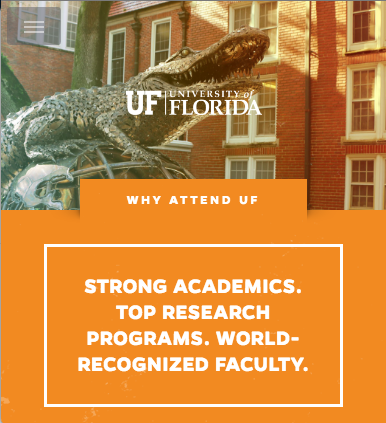 For any questions you may have, you may contact our faculty supervisor, Dr. Langkamp-Henken at henken@ufl.edu or (352)-294-3721. Graduating this term? Be sure to apply for your degree before the application deadline, Friday, February 2 @ 5pm. 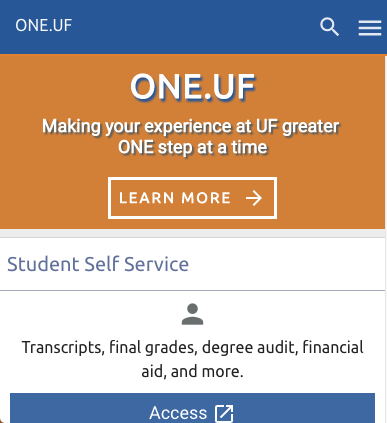 Apply through ONE.UF > Student Self Service > My Record menu> Certificate/Degree Application. Currently has 3 preschool positions open. 2 Full Time VPK certified positions, and 1 Part time, M-F 830-1pm, floating position. Please send resumes to GCDSINFO@GMAIL.COM. For more information click here. · Earn more than $6,500 during the summer. Teachers typically earn between $550-$700/week. The Institute teaches developmental reading programs in partnership with the continuing education departments of more than 100 colleges and universities across the United States. Our classes for students of all ages improve their reading skills and teach them to experience absorption in literature. We invite you to submit an online application and learn more about teaching for the Institute. Practice Makes Perfect (PMP), a NYC-based organization that partners with schools to provide academic summer programming for students in high-need communities is seeking highly motivated sophomore, junior, and senior undergraduates and graduate students to serve as our PMP Teaching Fellows. PMP’s intensive five-week program uses an innovative near-peer mentorship model that pairs struggling students in grades K-8 with high-achieving role models from the same community. Our competitive fellowship places students with an interest in education and a passion for narrowing the achievement gap in front of these classrooms in the schools that need them the most. PMP Teaching Fellows will undergo comprehensive training that prepares them for the rewarding responsibility of leading a classroom and will receive one-on-one support from a NYC-certified teacher throughout the summer. Our Teaching Fellows are instrumental in combating the summer learning loss and narrowing the achievement gap in NYC. This is a paid position. For more information and to apply, please visit practicemakesperfect.org/summer or email fellowships@practicemakesperfect.org. Camp Wicosuta is need of a few great counselors this summer to run our program for our 7-15 year old campers. This is a traditional four-week sleepaway camp for girls in Hebron, New Hampshire that offers two sessions. Located on Newfound Lake, working at Wico is a perfect job for someone who loves working with kids and wants to spend their summer outside! You can learn more about our program here. If interested, please contact Carly Meltzer at carly@campwicosuta.com or call 800-846-9426/914-946-0927. Archimedean Upper Conservatory is looking for a highly qualified individual to fill a full-time teaching position for English. Further details are located here. If interested, please contact the Director, Demetrios Demopoulos at demetrios.demopoulos@archimedean.org or call 305-301-2607. Looking for teachers certified in the areas of Language Arts, Mathematics, Science, Social Studies, Reading and Electives. Applicants must have obtained or be in the process of completing requirements for a Professional Florida Teaching Certificate. See attachment for registration and location information. Twenty-seven schools (K-12) will be showcased and prospective teachers will be able to visit school exhibits and speak with school representatives. Pre-screening interviews will also be conducted in preparation for making contract decisions. In order to expedite the registration process, we are requesting that all potential recruits pre-register. Also, please complete an on-line certified teacher application. If you need further assistance, please contact Melissa Tate @ mtate@rhmail.org. Volusia County School District located in central Florida is currently recruiting teachers for our 2018-19 school year. Applicants must currently hold or be eligible for FLDOE certification. Questions should be directed to: Teacher-recruitment@volusia.k12.fl.us or 386-734-7190 ext. 20168. Capacity is limited. See attachment and Why Volusia for more information. Operation Groundswell is a non-profit that runs travel, community service, and experiential education programs around the globe. We dig into social justice issues while working in solidarity with local activists, non-profits, and communities. We want you to join us in the fight for a better world. It’s time to make the whole world your classroom! Programs are filling up quickly, so apply as soon as possible. Financial assistance is available for all students on five- and six-week programs. Apply by March 8th. Can’t travel in the summer? We travel all year long! Aces in Motion is offering a fantastic volunteer opportunity for students through our on-campus program called Gators in Motion! Gators in Motion (GIM) is a program that brings underserved middle and high school students onto campus in order to provide them with one-on-one tutoring, recreation, enrichment, life skills lessons, and field trip opportunities. We are looking for Department of Education students who can act as tutors and mentors to our students. The program takes place Monday- Thursday from 3:45- 6:15 in the Florida Gym. Students will be asked not to use their cell phones during programming time in order to be engaged and a role model to the students. Your main role will be a motivator to the students, encouraging them to get their grades up and to work hard during homework time. If you would like to get involved, please e-mail the Program Director, Shannon Fenn, at shannon@acesinmotion.org. If you love kids and are looking for a way to get involved, then consider volunteering with the Gator Junior Golf Association, Gainesville’s only non-profit junior golf program! As a volunteer, you would be mentoring and helping kids ages 5-14 to develop both golf skills and life skills that can be used on and off the course. Only basic golf knowledge is required. If interested, please visit our website, gatorjuniorgolf.org, for more info and email Tori at gatorjuniorgolfassociation@gmail.com. You must love children and be mature, reliable, trustworthy, punctual and organized. You will need to work Tuesday-Friday around 12-6 depending on the day, with an occasional evenings/weekends. Duties will include picking up from school, taking to afterschool activities, homework, making meals/lunches, laundry, and light housekeeping. We are a non-smoking household and you must be a nonsmoker. You must have a reliable car and clean driving record. Please contact Nicole Foland at colegator@cox.net or 352-246-8560.